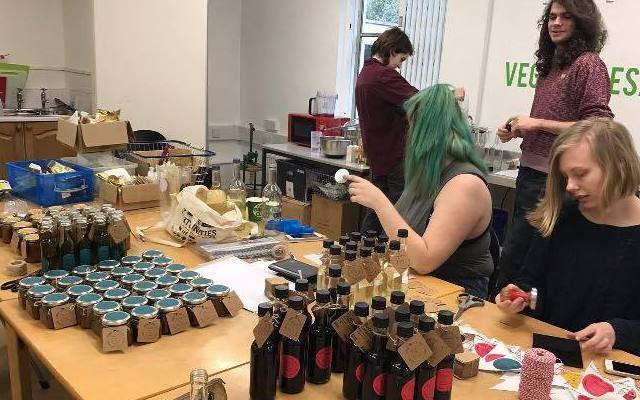 Volunteering at a social enterprise: "I wanted to give something back"
In this guest blog, student volunteer Kristina Kjønigsen at Roehampton University shares why she started volunteering at food enterprise Growhampton, how she's helped its development - and how the experience has changed her. A friend introduced me to Growhampton during freshers' week 2016. I must admit that I was a bit sceptical, especially because my fingers are every colour but green. I could see myself killing every plant. Since that first session, I have grown to love gardening and my fingers are slowly tuning green. As a regular volunteer, I have seen my efforts create life, which felt amazing! I have also met lovely and wonderful people. Because I got so much out of Growhampton, I wanted to give something back. When they released their plans for creating a new social enterprise, I just knew I had to be a part of it. My interest grew when I learnt that the enterprise was based around sustainability. I wanted to expand my knowledge and meet others who care for sustainability. I am now a volunteer for the student led enterprise This Is Our Jam. In the early stages, I came along to the NUS Student Eats conference in Leeds with two others: the Growhampton Project Co-Ordinator and the student director of This Is Our Jam. Among other things, we learnt how to preserve food (we even got to bring our own delicious pickled veg home) and how to run an enterprise. We also got to meet people who worked on similar projects as us and shared ideas with them. Before the launch date on the 9th of March 2017, the team had to create a brand and make produce. The group met my expectations here: we respected each other and listened to every idea. We have continued to work well together. Recently, we got together to create a business plan. I didn’t have any experience in this area, but luckily some of the other people involved did. During the meeting, we looked at the weaknesses and strengths of the enterprise, and had them in mind when we set goals for the future. We also discussed a campaign we could run to get more people involved, as this is one of our tougher jobs. In the time I have been volunteering, I have become more aware of the choices I make when it comes to food. When grocery shopping, I now think of the food`s packaging and where the food comes from. I also look out for the Fairtrade logo more than I used to. These changes came from a training session given to us by Tilly from Sustain: the alliance for better food and farming, when we discussed what made food sustainable. I have also become more aware of the environment in general, because I spend a lot of time around people who care about our planet, I make a bigger effort to be environmental friendly. I will continue to volunteer with both This Is Our Jam and Growhampton during the rest of my time at the University of Roehampton, and I was recently elected as Roehampton’s environmental officer, and so I will work with Growhampton to run campaigns and events in hope to raise awareness among students about the environment and sustainability. I look forward to meeting new volunteers in the years to come and I am excited to see our enterprise develop and grow. Why not start your own food social enterprise with start up support from Student Eats?